Sauris Museums: Two Small Jewels of History and Art in a German-speaking Alpine Community. Sauris Museums deals with the two main cultural institutions found within this German-speaking Alpine community. The Historic and Ethnographic Museum (the latter is pictured above), however small, display an interesting array of objects from religious and secular life. Of the two museums in Sauris, the Historic museum dedicated to Saint Oswald (Sant'Osvaldo) – hosted by the rectory in Sauris di Sotto ('Lower Sauris') – was created to document the history of the community through the events linked to the cult of this English king and martyr, widely venerated in this part of the Alps. Oswald was an English king who lived in the 7th Century AC; he later became a saint and was much venerated in the Alps, plus other parts of Italy, Austria and Slovenia: this sanctuary has been frequented by hundreds of thousands of pilgrims – coming mainly from the Veneto and Friuli – ever since. The exhibition is aimed at illustrating some aspects of this devotion and its links with the land. Another aspect being dealt with in the museum is woodland management. Wood has always been very important for the economy of the area, and this is well represented through maps and scrolls of Sauris since the 1400s and 1500s, showing also the consecration of local churches. Many “ex-voto” are exhibited in the museum, and were donated in particular by Venetian pilgrims. The objects coming from Germany also bear testimony to the fact that the so-called “Cramars” (itinerant street vendors from Carnia) were reaching faraway lands, and bringing items with them upon return. There is also a wide collection of holy vestments. Integrating the small museum of Saint Oswald is the Ethnographic Centre in Sauris di Sopra ('Upper Sauris'). This museum (also called “Haus van der Zahre” – ‘Zahre’ being the name of the community in the local language) is born out of a project whose aim is to document the diffusion of customs and traditions within the broader history of the community – a history that starts around 1250 AD, with the arrival in the Lumiei valley of families from Ost Tirol (East Tyrol) and Lesachtal, part of present-day Austria. The Ethnographic Centre was conceived as a ‘container’ for exhibitions aimed at providing the visitor with a clear vision on the daily life of people that have made this valley their home for the last seven centuries. The goal is that of highlighting the environmental/geographical connections that will allow for a better understanding of the relationship between working tools and community, so to uncover what lies ‘beneath’ the traditional way of life. The permanent collection – whose reorganization is currently underway – includes an impressive loom from the 1800s. Very often, in the case of Sauris, in order to gain understanding of the origins of an object that used to be – and may still be, in some instances – of daily use, a comparison with the surrounding valleys of Carnia may not be sufficient: it is necessary to look further afield, and to search within the agricultural and cultural tradition of the Austrian Alps, where the original inhabitants came from – Kärnten in particular. 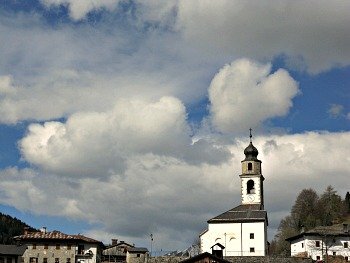 In this process, even language plays an important role, as the inhabitants of Sauris have maintained full use of their old idiom, which is of German origin, but was later interspersed with Italian words and – above all – the language of Friuli, thus creating an unusual linguistic blend. The building of the museum is structured on three levels, thus reflecting the distribution of a typical local vernacular house, with a basement and two upper levels (a main floor and an open ‘loft’, just under the roof). As most of the other houses in Sauris, the building that hosts the Ethnographic Centre also provides valuable evidence of the local way of constructing and resolving problems linked to the organization of living spaces in such a harsh climate – which is another factor that contributes to explain the originality of vernacular architecture in Sauris, when compared to other neighbouring valleys of Carnia. The typical house here includes a basement built in stone – sometimes whitewashed on the outside – which is usually independent from the rest of the house, while the floor above can be accessed directly from street level, even with carts. The main body of the house (the main floor and the loft – if existing) is built with logwood tied at the corners with wooden pins – a traditional building technique known as ‘Blockbau’ in German (‘Schroate’ in the local language). The main floor also displays open balconies arranged as a cladding around the main body of the house; these balconies usually have horizontal rods which were traditionally used to hang hay, for it to dry in the sun. The level just under the roof, or loft (‘sottotetto’ in Italian) is usually accessed directly from external stairs, and is closed by a mantle realized with vertical wooden boards; a shed in the central section was usually created for the deposit of tools. 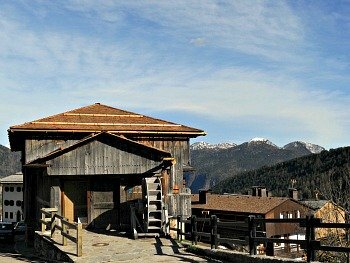 The roof presents two very ample and little inclined eaves that were typically covered with wooden tiles in larch or fir (known as 'scandole' in Italian), similar to those employed in the area of Forni di Sopra as well as in nearby Cadore. A document of 1328 attests to the existence, in Sauris di Sotto, of a sacred building dedicated to St. Oswald (pictured above), whose cult was probably brought here by the first inhabitants of the valley, coming from nearby Kärnten (Austria). Perhaps, they also carried a holy relic with them — a thumb. The cult of this saint had particular fortune in southern Germany and the Alpine countries starting from the Middle Ages. Born in 604, Oswald was king of Northumberland, a region of northeastern England. With the help of Bishop Aidan, he evangelized his people. He was humble and generous, especially with the poor. He died in battle at Masefield on August 5th, 642, killed by the Pagan king Penda. The virtues of Oswald, together with his violent death, fed his reputation of sanctity, giving origin to numerous legends. In Historia ecclesiastica gentis Anglorum, compiled by the venerable Bede in the 8th C, it is narrated that Oswald’s intercession would have freed by a plague epidemics the monastery of Sesley, in Surrey. During the course of the Middle Ages, Bede’s account was enriched by new elements. The figure of Oswald acquired the ideal features of a Medieval knight: beauty, physical vigour, heroism, solid faith. Other legendary traits can be traced in the accounts that have further developed in Germanic countries. More detailed information can also be found on the page dedicated to the history of Sauris. 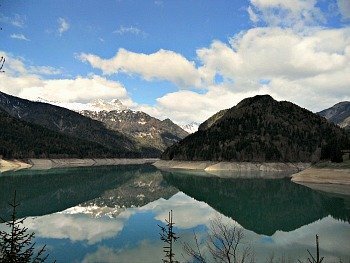 Below is an image of the picturesque lake of Sauris.